When Lou Sandoval was 22, he had one of the most difficult conversations a graduating senior could have with his parents. Sandoval had logged long hours studying biochemistry at DePaul University in Chicago and had been accepted to medical school. He would be not only the first college graduate in his family, but also the first doctor in his extended family. Everyone was thrilled. And yet, closing in on graduation, Sandoval decided he wanted to pursue a career in business. With no job prospects in sight, he didn’t know how to tell his parents without feeling like he was letting them down. 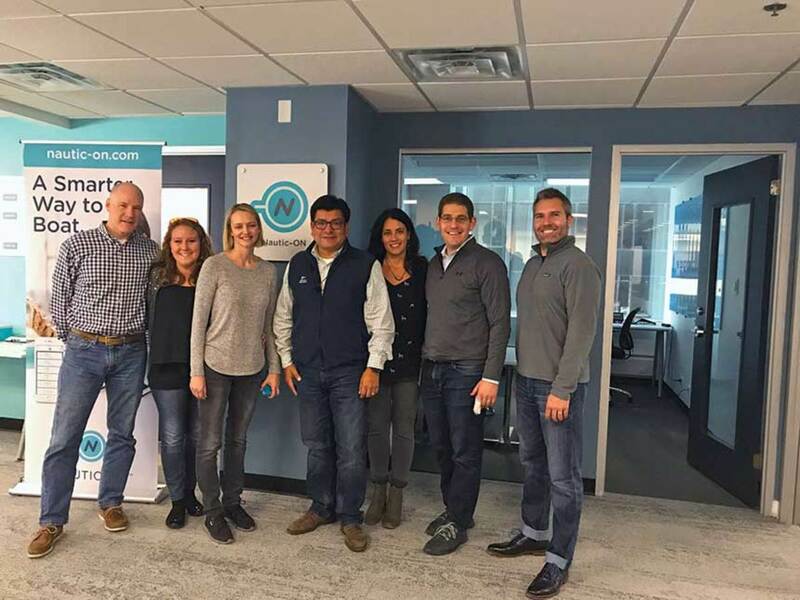 Two weeks later, Sandoval received a telegram from Abbott Labs in Illinois, inviting him to join a newly formed management development program for graduates with science backgrounds. He had found a career in the pharmaceutical industry. Currently national director of business development for NAUTIC-ON, Sandoval has one of the industry’s most eclectic resumes. A native Chicagoan, the first part of his career was spent managing sales teams for pharmaceutical giants Abbott, Bristol-Myers Squibb and Johnson & Johnson. Inspired by his love of sailing, he bought a sailboat dealership in 2002 and exited Big Pharma. For the next 15 years, Sandoval grew Karma Yacht Sales into one of the leading Beneteau dealerships in North America. After selling the dealership, he joined Brunswick’s NAUTIC-ON in 2017. 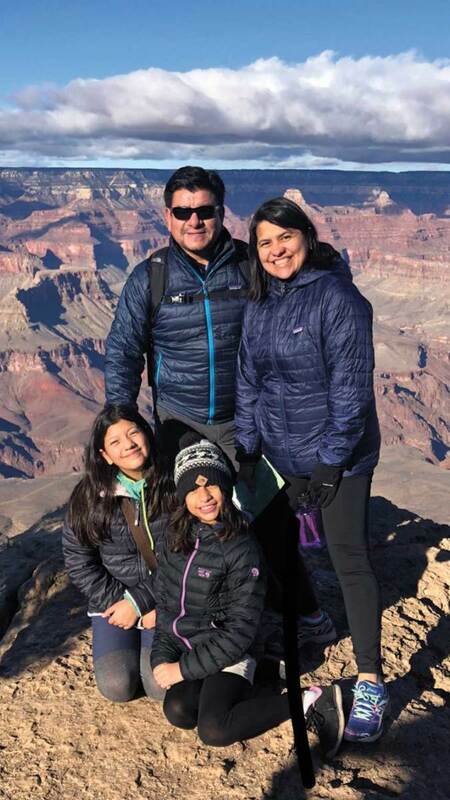 Married to Sonia, a financial services provider, Sandoval has two daughters, Sarah, 10, and Sofia, 12. Sandoval, who learned to sail at a Boy Scouts of America summer camp in Michigan, is a passionate racing sailor. He won his section in the Chicago Yacht Club race to Mackinac Island a record nine times in 19 races. Today, he and his family enjoy cruising and sailing on their 36-foot Beneteau, Karma. 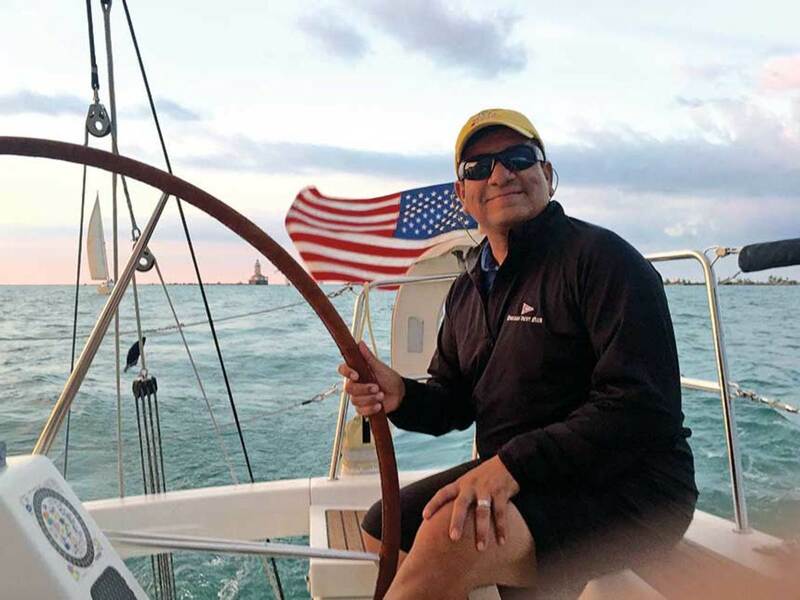 Sandoval sits on the boards of the Recreational Boating and Fishing Foundation, Sail America, the Recreational Boating Leadership Council and the Chicago Yacht Club, where he was recently elected commodore. He also has been on the national board of the Boy Scouts of America, along with former U.S. Department of State Secretary Rex Tillerson and former U.S. Department of Defense Secretary Robert Gates. 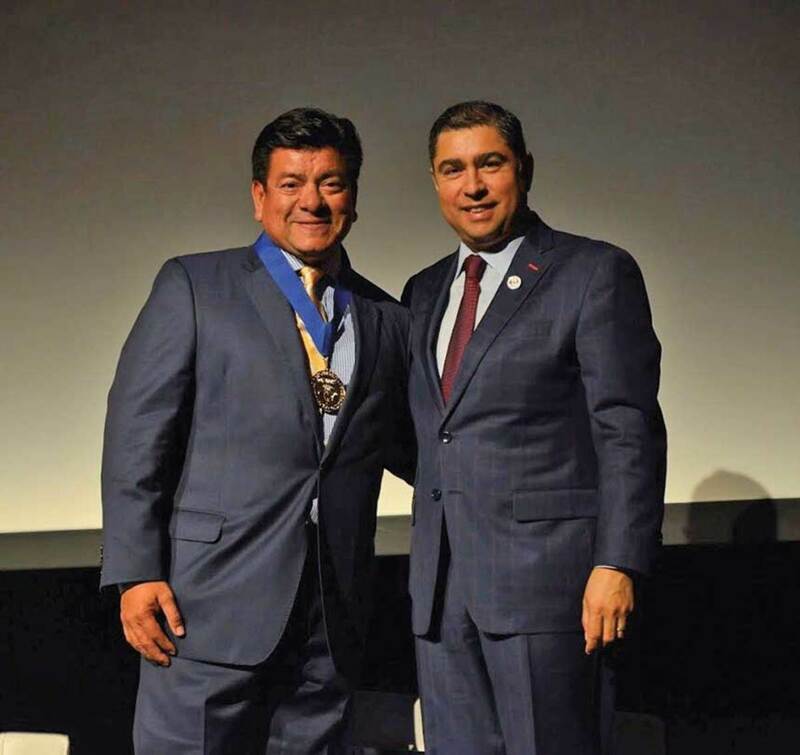 Sandoval (left), with Jorge Ferraez, received a prestigious 2018 Maestro Award recognizing national Latino leaders. Your resume combines corporations and entrepreneurial pursuits. How did you come to boating? I actually didn’t have much connection to boating growing up. I lived on the south side of Chicago, a block from Lake Michigan, but we were never on the water. I learned to sail in summer camp in Michigan as a Boy Scout. Sailing really sparked something in me during those summers — as did science. I was passionate about both. I earned a merit badge in sailing and every merit badge I could find in science. Did you sail consistently after that? Not much until I finished college. As a kid, I played baseball, football and ice hockey. I had a fairly simple, blue-collar upbringing. My dad was a steel worker and my mom a homemaker for most of that time. Boating wasn’t part of our lives at that point, except for summers at scout camp. Dad was a firm believer in paying it forward generationally. He made a lot of sacrifices. My parents were big believers in education. Because of his hard work, my brother, sisters and I went to Catholic grammar and high schools. I received a scholarship to DePaul University, where I studied biotechnology. Is that how you moved into the pharmaceutical industry? I did my senior thesis on the tumor necrosis factor in immunology. I was accepted into med school but wanted to do something in business. Abbott Labs hired me out of college for a new management program they’d just started. I spent the next 17 years working for Fortune 100 pharmaceutical companies and some small biotech firms in sales and marketing. At one point, I managed a 400-person sales force, with a region from Illinois to Colorado. During those years, I moved from Chicago to Seattle to Miami and back to Chicago. At that point, you started sailing? I started racing J/24s on Lake Michigan in the early years of my career. When I moved to Seattle, I did Transpac races to Hawaii, and Newport-Cabo races from California to Mexico. When I moved to Miami, I sailed Key West Race Week and did the Newport-Bermuda races. After I came back to Chicago, I started sailing the Chicago-Mackinac Island races on Lake Michigan. Nineteen Macs later, I’ve been racing competitively for 25 years. How did you move from the pharmaceutical industry to owning a sailboat dealership? I’ve always had an entrepreneurial spirit. When I was working in Seattle and Miami, I started boat management companies as side businesses. When I moved home to Chicago, I bought a sailboat with my brother and two high-school friends. Chiquita was built by AMF in 1978. She had an ugly yellow exterior and even uglier brown plaid interior. After three years, we got tired of dumping cash into her, so we bought a new Beneteau 33.7 for racing and named her Karma. During that time, I got to know the dealer. He found out I was in sales and marketing and asked me to work a few boat shows. It turns out he wanted to sell the dealership, so a partner and I decided to purchase it. We put a business plan together, got Beneteau’s blessing, and completed the purchase in 2002. What was it like being a sailboat dealer? As soon as we closed the deal, the dotcom bust happened, followed by 9/11. But that really showed us what this country was all about. Small entrepreneurship is really the backbone of this country, and my partner and I both had to use all our perseverance and passion to make the dealership succeed. Ultimately, we went from 28 percent market share in the Lake Michigan area to 54 percent. How did you move the needle that much? I was 39 and still single at the time, and my partner was the same age and just engaged. We started targeting people like us — single folks or double-income-no-kids couples — and hired some similar salespeople, so clients could see themselves reflected back in our dealership. By that targeted marketing, we were able to bring the buyer profile age down from 58 years old to 53 in just a few years. Why did you call the business Karma Yachts? Karma reflected our philosophy on service: the belief that waves of good fortune follow admirable actions. The previous owner had operated the business from his basement and wasn’t great at returning phone calls from customers. The guys who had been with the company for 15 years had been trained organically, but without the basics of customer service. I was a big believer that if we were going to succeed, everyone had to be on board. We funded their year-end bonus structures to help make sure we all had the same goal of making our customers happy. One of my proudest achievements was getting a perfect 100 percent CSI score from Beneteau. I was told not many people had done that. We also won a lot of president’s awards for sales. The awards are great, but what’s more important is that customer service fills the sales funnel. Nothing builds more revenue and success than a customer who is happy with your product and dealership. When you’re a dealer, there’s not much time to sit back and reflect on what you’ve accomplished. You just go from one challenge to the next. We had a 10-year anniversary for the dealership and invited owners. Some were on their fourth or fifth boats. I don’t keep score like that, but the occasion made me look back and see how we’d built up that business. It was a revelation, and I admit I got a little emotional about it. The Sandovals take most of their vacations in the great outdoors. You recently won a Maestro, which is an award presented to the most influential Latinos in the United States. What did it mean to you? I was flabbergasted. I shared the award with some very impressive people. Ralph De la Vega, the former chairman of AT&T, had also sat on the national board of the Boy Scouts of America with me. He’d won a Maestro, as have many congressmen, cultural and business leaders. I was humbled and honored. It also showed that they understood who I was as an entrepreneur. Like our dealership anniversary, the award made me reflect on my years in the boating industry. It showed how I’ve been a builder of dreams. One of the main goals of my career has been getting people on the water. It may sound basic and even cliché, but I remain very passionate about finding creative, new ways to do that. Has being Hispanic in this industry presented challenges? I try not to wear that on my sleeve, and I treat people like I’d like to be treated. It generally works pretty well. I think we were just brought up that way. You’re talking to a guy who had the only Hispanic name on his hockey goalie jersey. There must have been occasions when something came up. One of the funniest stories happened in 2005, right after we bought the business. The industry was in full recovery, and we were selling more boats than we could commission. That meant all hands on deck, including us owners. I was out cleaning a boat and looking pretty grubby when a guy came up to me. He spoke very loudly and clearly, asking me if I knew where the owner was. I went below and turned down the stereo, but he kept talking in that loud, slow voice to make sure I understood. I said, “I’ll go find him,” went below, came up again and said, “How can I help you, sir?” He turned beet red and said, “Well, I guess any discount is out the window.” We’ve become the best of friends and still laugh about it. But it was an interesting experience for him from a cultural awareness standpoint, that it’s possible for Hispanics to own boat dealerships. Why did you transition to NAUTIC-ON? I sold the dealership in 2017 and began looking for the next opportunity. We’d looked at a marina and boatyard, but it failed the due diligence for contaminants on the land. It was more than my investors and I really wanted to take on. Then I heard about a new business unit at Brunswick Corp. and reached out to senior management. We had an instant connection. I told them what I saw as its general mission while making the business case for the technology. It was exactly what they were envisioning, even though they didn’t have a name for the company yet. I knew what the average dealer goes through and what builders are challenged with, so a technology that makes boating easier for consumers and dealers really spoke to me. It can be a great backbone for helping dealers work more efficiently and profitably, while growing in scale. The NAUTIC-ON team functions as a small tech startup operating independently from parent Brunswick Corp. This was more like joining a startup than a big corporation, right? There was an immediate alignment of what I stand for with what they stand for. It just clicked. They saw my passion firsthand. I’ve been in a couple of organizations where we created teams from the ground up, so I relished this opportunity. The NAUTIC-ON team is an amazing and highly motivated group of individuals. Our goal is making boating easier for boaters and helping the marine service side be more efficient. Everyone on the team is an overachiever, regardless of age, and nobody is hung up on titles. It isn’t that different from my dealer days, where you had to be CEO and head bottle-washer at the same time. Very well. We launched our NAUTIC-ON Boat IQ Smart Diagnostics at the Miami show. It’s like any tech company where you’re constantly refining the tool that we use, based on feedback from customers and others. We’re downtown in an office in the Brunswick Loop Lab. It’s very plain Jane, with white tables, whiteboards and lots of Post-Its. And tons of conversations. We approach all major decisions as a team. If I had to describe it, it’s a small business inside of a large corporation. 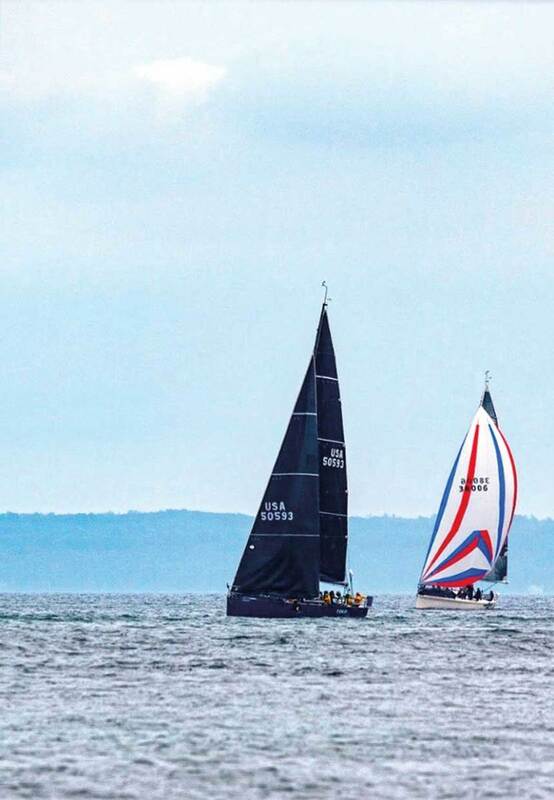 Tango in Blue, helmed by Martin Sandoval, finished just seconds ahead of Eagle, helmed by brother Lou, in the 2018 Chicago-Mackinac race. You’re on multiple industry boards, and you were on the advisory board of the Boy Scouts of America. Did that interest come from your own days as a scout? I gained my love of the outdoors from my time in the Boy Scouts. It’s still the single largest leadership engine in our country, with people like Steve Jobs to Robert Gates all having been Eagle Scouts. Being an Eagle Scout teaches you to think beyond yourself and push yourself beyond normal boundaries. It’s a huge developer of character. I think it’s a candlelight for a new generation of leaders. We do a lot of family sailing, but I don’t push the sport on our kids. We’re on our second Beneteau 36.7, also called Karma, owned by my brother Martin and me. 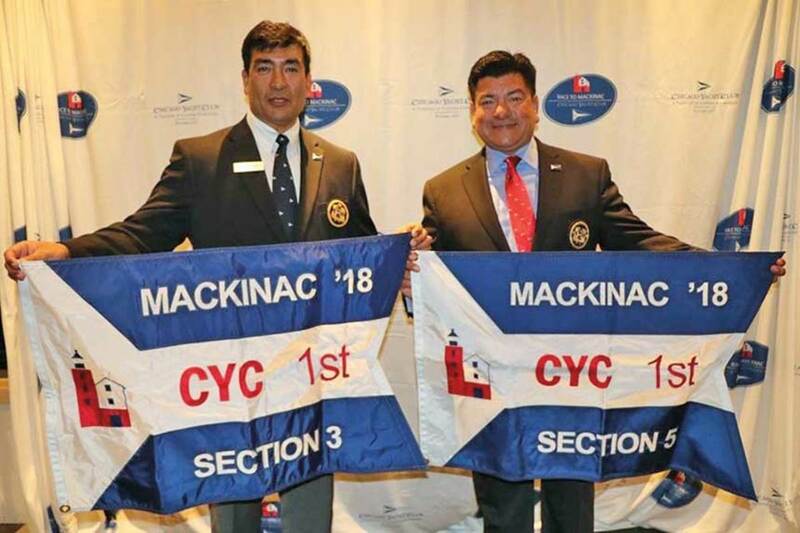 My brother and I were on eight of my nine Chicago Yacht Club Race to Mackinac victories. Last year was the first year we did it separately. We do a lot more cruising in the boat these days than racing. I’m a huge outdoors sportsman — boating, fishing and hunting. We take our family vacations in places like Sedona or the Grand Canyon, so the kids can climb the rocks. I like to do things that will teach my kids to love the outdoors.